It’s often the smallest spaces that boast the biggest design. You have to be seriously inventive to fit everything you need into a tiny area, and there’s no place where this is more evident than the kitchen. 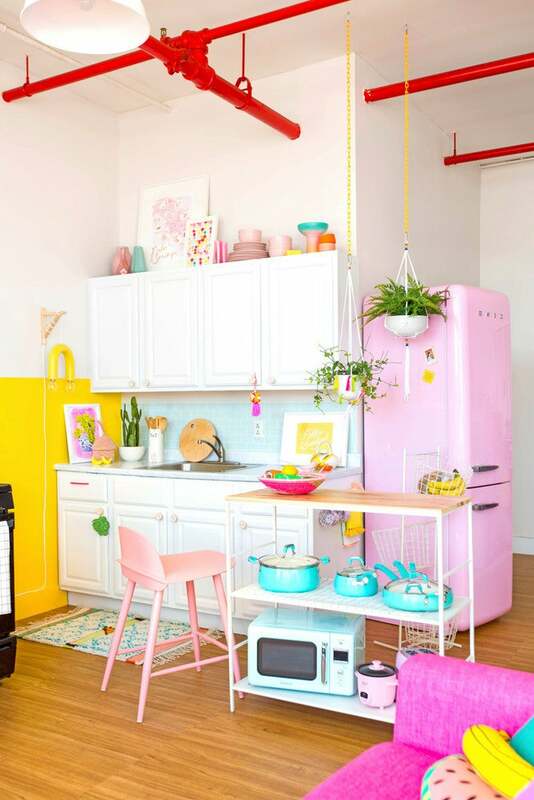 For example, in Aww Sam’s dramatic kitchen makeover, she fakes an island with an affordable table, and spruces it up with colorful appliances. Boring, this is not. Ahead, check out more of our favorite small space kitchens. Yes, this 265-square-foot apartment has a chef’s kitchen—and makes room for everything thanks to open stainless steel shelving that forces the owners to keep things clean and avoid visual clutter. A large farmhouse sink in this tranquil NYC apartment fools you into thinking the rest of the space is bigger than it is. Plus, open shelving draws your eye up and takes advantage of vertical space. This 480-square-foot apartment gets everything right. The nearly all-white palette keeps the feel light and airy, the soft wood accents add a touch of softness, and the bold graphic patterns are modern and fun. Nothing feels lacking here—including space. This kitchen actually belongs to a tiny luxury home on wheels. There are lots of clever elements at work here, giving the kitchen a larger feel. The skylights and white base obviously make everything appear spacious, but it’s the high-end finishes—shelf brackets, hardware, and sliding barn door—that make it hard to believe that this ultra-glam residence resides on wheels. Whenever possible, removing a wall can make even the tiniest of kitchens feel airy and spacious. This seriously small kitchen area is short on square footage, but you’d never feel it with such an open design. Clear glass “walls” dividing the kitchen and bedroom in this tiny apartment are the visual trickery at work here, making the most of a very small space. With sight lines extending from the galley kitchen directly to the bedroom window, there is plenty of natural light throughout—and gives the illusion that this micro kitchen is larger than its square footage suggests. The view of this kitchen from the bedroom illustrates just how small this Portland, Oregon, home actually is. A nearly all-white color palette, lots of light, and open shelving make this space seriously cheerful and inviting. We’d have breakfast at that bar any day of the week. Storage, storage, storage: This space is proof that a kitchen doesn’t need square footage to feel upscale, but it does need lots of well-integrated storage solutions. Because every inch of cabinet space is utilized, the countertops can remain clutter-free and clean, giving this kitchen a chic and almost minimalist feel. Not every micro kitchen needs a modern design in order to work. Instead of incorporating the appliances into the cabinetry, this space is happy to keep everything on display. The resulting feel is eclectic, rustic, and almost old-world, with cutting boards, dishes, and a vintage portrait on display. It’s tiny, it’s retro, and it belongs to a chic, 700-square-foot box home, proving that small spaces don’t have to be all-white in order to work. The bold tile and bright yellow cabinets give this tiny kitchen serious character, without detracting from its workhorse design. This post was originally published on March 14, 2016. It has been updated with new information.